Perform editing operations such as erase, move, and trim on the objects in a drawing. The most common of these tools are located on the Modify panel of the Home tab. Take a minute to look through them. To erase an object, use the ERASE command. You can enter E in the Command window, or click the Erase tool. When you see the cursor change to a square pickbox, click each object that you want to erase, and then press Enter or the Spacebar. Note: Alternatively, before you enter any command, you can select several objects and then press the Delete key. Experienced users often use this method as well. Sometimes you need to select a large number of objects. Instead of selecting each object individually, you can select the objects in an area by clicking an empty location (1), moving your cursor right or left, and then clicking a second time (2). 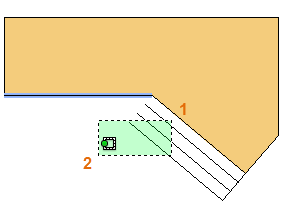 With a crossing selection, any objects within or touching the green area are selected. With a window selection, only the objects completely contained within the blue area are selected. The result is called the selection set, the set of objects that will be processed by a command. Tip: You can easily remove objects from the selection set. For example, if you select 42 objects, and two of them should not have been selected, hold down Shift and then select the two that you want to remove. Then, press Enter or the Spacebar, or right click to end the selection process. Note: Clicking and dragging results in a different selection method called lasso selection. Here's how you would use the COPY command to lay out a row of decorative tiles. Starting with a polyline that represents its shape, you need to make copies that are 1/8" apart. You click the Copy tool or enter CP in the Command window to start the command. From here, you can choose between two methods, depending on what's more convenient. You will use these two methods frequently. The second tile needs to be a total of 9-7/8" + 1/8" = 10" to the right of the original tile. So, you select the tile, press Enter or the Spacebar to end your selection, and click anywhere in the drawing area (1). This point does not have to be located on the tile. Next, you move your cursor to the right, relying on the polar tracking angle to keep the direction horizontal, and then enter 10 for the distance. Press Enter or the Spacebar a second time to end the command. The specified distance and a direction from a point (1) is applied to the tile that you selected. Another method, one that you will often use when you don't want to add numbers together, requires two steps. You start the COPY command and select the tile as before, but this time you click the two endpoints as shown. These two points also define a distance and direction. Next, to add the 1/8" space between the tiles, click the Move tool or enter M in the Command window. The MOVE command is similar to the COPY command. Select the newly copied tile, and press Enter or the Spacebar. As before, click anywhere in the drawing area and move your cursor to the right. Enter 1/8 or .125 for the distance. Tip: The two points that define the distance and direction don't need to be located on the object that you want to copy. You can use two points specified anywhere in your model. You can use the two-points method as a repeating sequence. Let's say that you want to make more copies of the circle at the same horizontal distance. You start the COPY command and select the circle as shown. Then, using the Center object snap, click the center of circle 1, followed by the center of circle 2, and so on. For larger numbers of copies, try experimenting with the Array option of the COPY command. For example, here's a linear arrangement of deep foundation piles. From a base point, you specify number of copies and the center-to-center distance. Most models include a lot of parallel lines and curves. Creating them is easy and efficient with the OFFSET command. Click the OFFSET tool or enter O in the Command window. Select the object (1), specify the offset distance, and click to indicate on which side of the original that you want the result (2). Here is an example of offsetting a polyline. Tip: A fast way to create concentric circles is to offset them. A popular technique is to use the OFFSET command in combination with the TRIM and EXTEND commands. In the Command window, you can enter TR for TRIM or EX for EXTEND. Trimming and extending are some of the most commonly used operations. 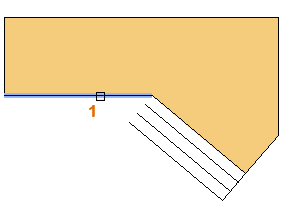 In the following illustration, you want to extend the lines that represent the steps for this deck. You start the Extend command, select the boundary, and then press Enter or the Spacebar. 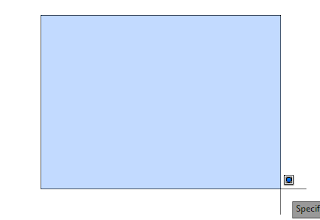 Pressing Enter or the Spacebar indicates that you've finished selecting the boundaries, and that you're now ready to select the objects to be extended. 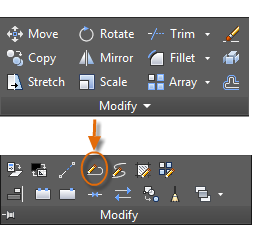 Tip: A faster method is to press Enter or the Spacebar right away instead of selecting any boundary objects. The result is that all objects are available as possible boundaries. Next, you select the objects to be extended (near the ends to be extended), and then you press Enter or the Spacebar to end the command. The result is that the lines are extended to the boundary. The TRIM command follows the same steps, except that when you select the objects to trim, you select the portions to trim away. The following illustration comes from a tile project. The walls in this residential bathroom are flattened out to be able to lay out the tile pattern and estimate the number of tiles needed. 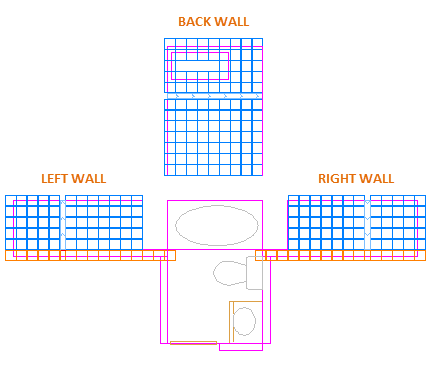 You can save a lot of work by taking advantage of the symmetry between the left and right walls. All you need to do is create the tiles on one wall and then mirror the wall across the center of the room. 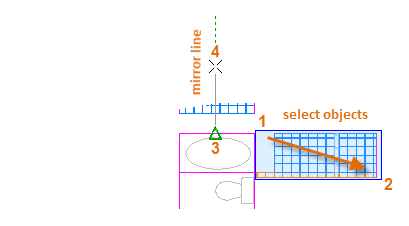 In the example below, you start the MIRROR command (or enter MI in the Command window), use window selection (1 and 2) to select the geometry on the right wall, press Enter or the Spacebar, and then specify a mirror line (3 and 4) corresponding to the centerline of the bathroom. Finally, decline the option to "Erase source objects" by pressing Enter or the Spacebar. Tip: Always look for symmetry to save yourself extra work, even if the symmetry is not 100% identical. You can stretch most geometric objects. This lets you lengthen and shorten parts of your model. For example, this model might be a gasket or the design for a public park. Use the STRETCH command (or enter S in the Command window) and select the objects with a crossing selection as shown below (1 and 2). The crossing selection is mandatory—only the geometry that is crossed by the crossing selection is stretched. Then click anywhere in the drawing area (3), move the cursor to the right, and enter 50 as the distance. This distance might represent millimeters or feet. To shorten the model by a specified amount, you'd move your cursor to the left instead. 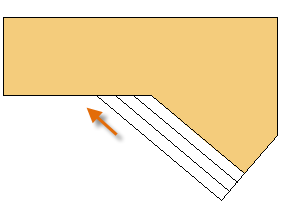 The FILLET command (enter F in the Command window) creates a rounded corner by creating an arc that is tangent to two selected objects. Notice that the fillet is created relative to where you select the objects. You can create a fillet between most types of geometric objects, including lines, arcs, and polyline segments. Tip: If you specify 0 (zero) as the radius of the fillet (imagine a circle shrinking to a radius of 0), the result trims or extends the selected objects to a sharp corner. The EXPLODE command (enter X in the Command window) disassociates a compound object into its component parts. You can explode objects such as polylines, hatches, and blocks (symbols). After you explode a compound object, you can modify each resulting individual object. You can choose from several useful options when you want to modify a polyline. The PEDIT command (enter PE in the Command window) is located on the drop-down list of the Modify panel. Tip: In some cases, the easiest method to modify a polyline is to explode it, make the modifications, and then turn the objects back into a polyline using the Join option of the PEDIT command. Grips are displayed when you select an object without starting a command. Grips are often handy for light editing. For example, the line below accidentally snapped to the wrong endpoint. You can select the misaligned line, click on a grip and then click to specify the correct location. By default, when you click a grip, you automatically start in **STRETCH** mode as indicated in the Command window. If you want to explore other ways of editing objects with grips, press Enter or the Spacebar to cycle through several other editing modes. Some people perform most editing operations using grips.